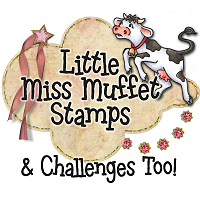 Did you have arrive here from MARIE BERQUIST'S blog in our winter blog hop? 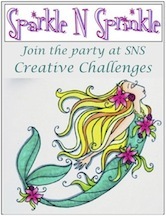 If you did not get here via Marie, perhaps you might want to go to the Sparkle and Sprinkle Blog to see all the participating sites and get the low down on the snowy trail. Yes, its that time again.....to begin planning for your holiday cards. Can you believe it? And the designers have been busy creating samples to help get those creative juices flowing. Here in Wisconsin, it has been a bit chilly so I am starting to think SNOW (oh, and I am also starting to think that its time to head back to Florida...LOL). 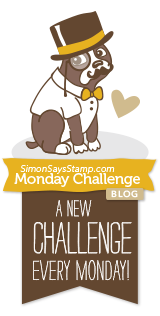 My first inspiration came from the new Playful Penguin stamp set 438. 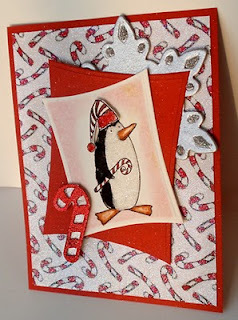 I used the Candy Cane Penguin because I thought that he would be cute for my grandsons' cards. I took designer paper with candy canes on it and used one of my new favorite techniques- - -applying embossing powder over the entire surface. Simply rub the versamark pad directly to the entire surface and emboss with your favorite powder! Here I used Sparkle embossing powder EP107. I used two Sparkle and Soft colors for the penguin body. Die cut a snowflake using the Grand Caliber, painted it silver and added glitter. Used wonky rectangle die cuts and a candy cane charm colored with glitters. Full directions can be found on the SNS website here. The next card inspiration came from the Winter Swirl stamp set 414. I have been wanting to make a tent topper card (see SNS tips and techniques section) and this reindeer was just asking to be on my card. I started with the reindeer using Stickum Powder EP300 and Sparkling Sands Sparkle N Soft SS118. Doesn't the deer look soft? Next die cut using the Grand Caliber and a circle die, layer onto the lacey circle die cut from gold cardstock and finally place on olive mulberry paper. 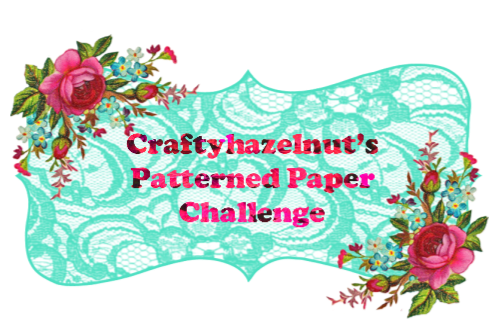 Love mulberry paper! The base card was stamped using the trees from this set in 2 colors, and then offset stamped using versamark and then embossed with Sparkle EP107. You can view the full directions for this card here. Hoping that you got some ideas from these cards. Its time to slide over to the next talented designer's blog: KIM JAIME has more fun and inspiration for you to see here. 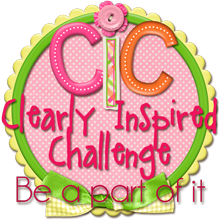 Don't forget to leave a comment below to be eligible for the blog hop prizes! And thanks so much for stopping by. P.S. 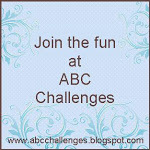 I will be giving away a special prize from me to you! 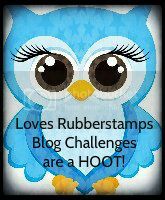 All you have to do is sign up during the blog hop to be one of my blog "followers". Look on the far right side near the bottom where it says followers and sign up. 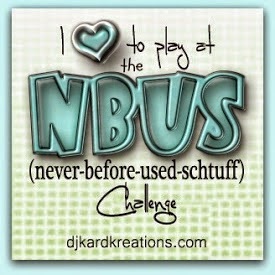 I will randomly choose one of my new followers to receive one of the new SNS stampette sets. Good Luck. Sandy I love the candy cane pengie and I really want to touch your second card...so inviting. Nice cards. Sandy, you've captured That Pengie in his element PERFECTLY! Amazing what colors and textures do for the feel of a card, and your second card is no different. With the mulberry paper and EP, I can feel the majesty of this buck in his forest. 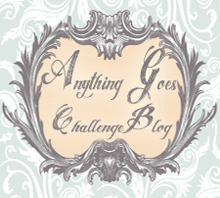 Thank you for making such lovely additions to this blog hop! Lovely cards. The candy cane card is my fav. Love the razzle-dazzle of the Penguin card. Wonky squares - lots of glitz - just darling! The second card reminds me (too quickly) of my back yard in the snow - yes with the deer there too! Just gorgeous! Love your jazzed up designer paper Sandy - it's PERFECT for that stamp. And doing the deer in Sparkle N Soft - how perfectly warm & fuzzy - love the natural colors on that card too. Great cards! Great Cards, very inspiring. Love them, thanks for sharing with us! Sandy, I especially like your use of Mulberry paper. I'm also a big fan of it. It would also work well as a mat for a Christmas tree focal, but it's very neat for the deer. Thanks for the idea. Love the soft feeling of the raindeer card. But... I especially enjoy the Pengie card. I love how everything is off-set. Thank you for sharing! Hands down the best card for cuteness! And cutting with wonky rectangles adds to the fun of your card. Your deer card captures the softness of snow while highlighting that beautiful stamp ~ very, very pretty! Love the reindeer card - very elegant! Sandy, your penguin card really makes me smile. The deer card is very elegant. Very nice. The EP over the candy canes just sets that card off, nice work. The candy cane cards is so festive. Love the reindeer card. Wow! Amazingly wonderful cards. I love the one with the candy cane penguin especially. That is such a cheerful Christmas card and it will surely make someone smile big time. Really like the candy cakes - very festive and creative! oops...that should have said "canes"! Great cards. The background on the penguin card is great. Like both cards. The penquin card has so much life. I'll also be making the deer card for all my outdoor loving friends. Those are so cute! I love how the first one is so whimsical and the next one is so elegant! Thanks. Now I have a craving for Candy Canes but I not going to give in (yet). Saw that second card in the store and it is beautiful! Love all that sparkly softness....just like a real deer! Your Candy Cane card is one of my favorites on this blog hop! I love your ideas and the colors!! With 13 grandchildren, I agree that the pengie is number one on my list - but 13 variations may not be easy. The deer is beautiful and I can almost feel his softness. Thank you so much for the inspiration, idea, and taking the time to share. Love those adorable Penguin stamps! Great job! Great cards! I love the candy cane penguin, and the deer card is lovely. Great card. Love all the candy canes on the first card and the the 2nd one is so elegant. Embossing powder on DP? I would never have thought of that! Beautiful cards! Love them both, but especially the penguin one! So love the little penquin, he's really great with even more candy canes! Nice job. Another card with the cute candy cane penguin. Love it! Couldn't get much cuter than that penguin with the candy cane..and your reindeer card is just gorgeous! I am a new follower! Love the layers of the candy cane and penguin card. Very effective card! The soft and muted effect of the second card is wonderful. That little penguin is just so adorable and appealing! LOVE the candy cane colors and pattern! Signed up as a new follower! Wonderful job on both cards. I am loving both these stamps. I really like your card with the candy cane penguin. I was interested in your technique of rubbing the Versamark pad over the candy cane paper & embossing. I'll have to try that. 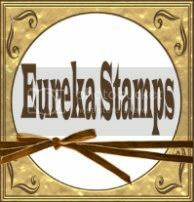 I would like to sign up to be one of your blog followers & be eligible to win one of the new stamp sets. I can't find the word follower on the far right side near the bottom. The penguin and candy canes is really cute ! I like your deer and how you made it look so soft and the uniqueness of the card - thanks for sharing ! wow very cute love the cards i realy love the raindeer one and the candycanes Pengie is so darn cute. thanks for sharing and for the chance to win. Sandy love the candy cane paper and embellishment. Wonderful cards! I love the way you tilted the panels on the Penguin card!